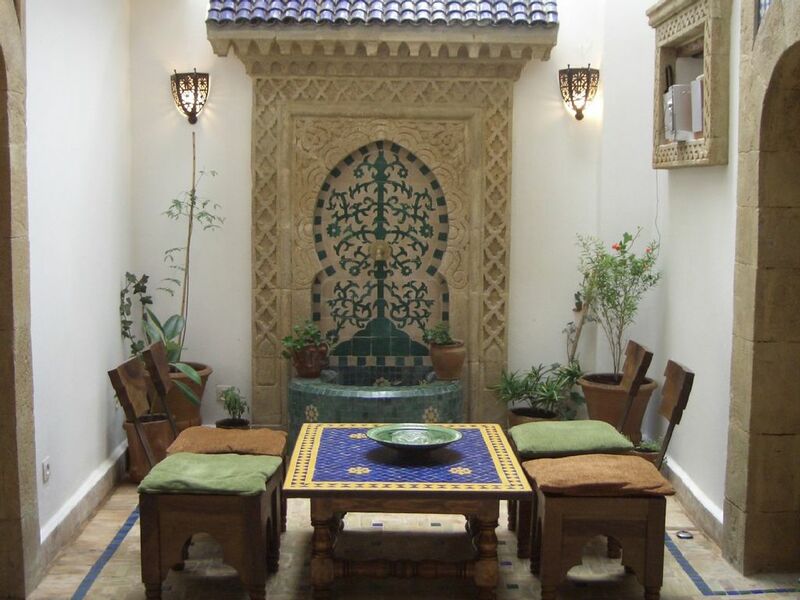 Hermoso buena ubicación riad para parejas, familias o grupos. Darsal es una incursión bien restaurado que ofrece paz y tranquilidad en el corazón de la vibrante e histórica Medina. Un tranquilo riad, tradicional en una calle tranquila, la playa, los zocos, el puerto, restaurantes, cafeterías y Plaza de Armas se encuentran a pocos minutos a pie, un gran lugar para disfrutar de la auténtica atmósfera de la ciudad vieja. Un montón de espacio para relajarse. En la planta baja se encuentra aa tranquilo patio con fuente en torno a la cual está viviendo / comedor con chimenea y cocina. En la primera planta hay un gran dormitorio tranquilo con ventanas francesas que dan al patio y un amplio cuarto de baño / un dormitorio en suite segundo con cama doble y una cama entresuelo (baja altura para 2 niños). El segundo piso cuenta con amplio salón con chimenea de leña, salón marroquí con 2 sofás-cama y cocina todas con vistas al patio. Hay una terraza privada con tumbonas, un lugar ideal para relajarse, tomar el sol o tomar una copa de vino. Mesa y sillas de patio para cenar al aire libre. También hay una preciosa terraza soleada habitación con cama doble y baño en suite. Hay otra terraza con vistas a la medina. Espacioso y relajante, todas las habitaciones tienen baño privado, wifi gratuito, caja fuerte, servicio de limpieza diario y cocina tradicional ofrecido. Combinando el confort moderno con la tradición marroquí este es el lugar perfecto para pasar sus vacaciones con su familia y amigos. Podemos organizar traslados al aeropuerto y excursiones de un día. También hay soporte para iPod y un Pay As You Go de teléfono móvil y el módem de Internet que puede utilizar. El ataque tiene dos áreas de cocina que son de planta abierta a la zona de comedor y salón, una en la planta baja y otro en el segundo piso ideal para comer en la terraza, o para más de una familia. Si es necesario podemos organizar para 2 personas extra a dormir en el salón marroquí. Our stay in Essaouira was thoroughly enjoyable due to Sally and her team, Aieda and Fouad. The house is beautiful, clean, comfortable, and charming. It is central to all in the Medina, so shopping, exploring, and dining out were no more than a seven minute walk from the house. Coming from the chaos and heat of Marrakech, Essaouira itself was a relief. The tempo, calm, and ease of the city made for a great five days. While we took advantage of the many fine and inexpensive restaurants nearby, we also had Aieda prepare a sumptuous dinner of fish with tomatoes and olives. I recommend highly Dar Sal if you're planning a stay in Essaouira. Many thanks Sally. Great location, house of real character, good facilities and fantastic housekeeper Aieda. Second stay didn't disappoint and hope to be back in the future. From the moment we arrived at Darsal, we knew we had made the right choice. Not only is the accommodation comfortable, characterful and quirky, but Fouad and Aida made us feel very welcome. Aida prepared a great value breakfast every morning and Fouad ensured our transfers to and from the airport went seamlessly. He also organised a dromedary excursion with lunch on our behalf. Essaouira's medina isn't particularly big and we found that all roads led back to Darsal, so we never got lost! It was so nice to be able to experience the sights, sounds and smells of the medina and souk, knowing we would return to a quiet haven in the evening. A fantastic experience - we'd thoroughly recommend it. Sally was prompt in replying to all emails and queries before our trip so we knew we would be well looked after. Thank you Sally, Fouad and Aida for your hospitality. Surprisingly spacious house in a perfect location. Couldn't fault the house and the location. Aida looked after us each day with breakfast (at a minimal extra cost). This house really is beautifully and traditionally styled. We all want to return soon. Cockroaches, toothpaste on walls, clumps of hair in the shower and in the fridge, hair on bedsheets! - these are just a few of the issues we had with the Riad. It clearly hadn't been cleaned at all from the previous occupants. I took photos and showed them to the host on our first day who was apologetic as was Sally (the owner). The cleaner and host returned to clean the Riad for us the next day and we were reimbursed for one day. However, the cleaner is also the cook and we didn't want to take up the offer of the cleaner cooking our meals because we doubted her sense of hygiene due to the poor cleanliness of the Riad. this meant that we had to eat out for every meal -( as I hadn't planned to cook on my holiday) and this in turn made a much more expensive holiday than planned. On my return I emailed Sally to make recommendations to her to improve on the standard as I know what it means to rent out property myself. She hasn't returned my email and I feel that she thinks reimbursing me for one night has paid me off! - I expect at least a reply to my email - it was very disappointing. However, on the other hand, we as a family, really enjoyed Essouira and found it to be a welcoming and beautiful town/city. We surfed, rode camels, shopped in the souks, and managed a day trip to Marrakech. It is a windy city, so take your sun glasses to protect your eyes, and ladies wear a scarf it helps with the wind and sun. I would recommend a holiday in Essouira but perhaps learn from my lesson and book a Riad style hotel in the Medina as they seem very nice. This guest was absolutely right, the house hadn't been cleaned before they arrived. This was an error on our behalf. It was the first and only time it's happened in 12 1/2 years of renting and we were all absolutely mortified when we realised what had happened. We did apologise, although I realise it should never have happened. We refunded the first night immediately and also rectified the situation. To ensure this situation doesn't happen again, we have employed a second maid to assist with cleaning and step in if there are any problems. I was disappointed to see this review and straight away contacted the guest as I had not received any post holiday communication. The guest sent me the email and let me know that I hadn't received it previously, because she had typed my personal email address incorrectly. The email was predominantly constructive and helpful and I have replied to the comments including the dead cockroach, as there was one near the winter wood pile downstairs. I really have a bit of a phobia, so regular precautions are taken but it should have been swept away in the routine clean that didn't take place. I was also sorry that she didn't want Aieda to cook for them, she does get good reviews, but I understand her point and the impact it had on the cost of her holiday. Unfortunately I did not receive the email and therefore did not have the opportunity to offer an acceptable resolution. Again I apologise for our communication error that lead to the house not being ready for the guests arrival. This incident has led to us reviewing our arrangements and take on extra staff. It was never my intention to ignore a complaint and if I had received the email I would have sent a timely reply. We always welcome feedback that will help us improve our guests holiday experience at Darsal. This beautiful riad really was the most amazing place to stay. It was the first time both my partner and myself had visited Morocco and I feel there was no better property we could have stayed in. The 5 story riad is so beautiful, the master bedroom in particular as it looks down onto the centre courtyard which can be highlighted at night time. Sally and the house man Fouad ensured the smooth and easy transfer from airport to riad and while we were there Fouad checked up on us to make sure we were getting on okay and also organised a trip for us to Marrakesh for the day (really worth the 2 hour taxi drive). For only 30 dirhams the maid Aieda made sure we began each day with a substantial breakfast including pastries, pancakes, eggs, yoghurts, bread and fruit and yes that is all included in one breakfast!! The beach was a short 15 minute walk away however we spent most of our time at the other end of the bay at a water sports company called Explora where we had surf lessons, went quad biking and hired some Stand Up Paddle boards. Essaouria is definitely not short of amazing places to eat, we both had some really delicious meals while we were there, 2 of which were cooked by Aieda in the riad! All in all a very relaxing holiday whilst enjoying an authentic cultural experience of Morocco. Essaouira su una encantadora antigua medina (ciudad amurallada), cuenta con un centro de colorido y vibrante, con muchas calles y zocos para explorar misteriosos e interesantes. A poca distancia están las históricas murallas portuguesas, un pequeño puerto pesquero de trabajo con ella es azul barcos tradicionales que traen la pesca del día y de la playa larga 3 millas, donde hay una gran variedad de deportes acuáticos. No hay coches permitidos dentro de la Medina, que le da un ambiente muy libre de problemas. Hay un montón de restaurantes que ofrecen una variedad de cocina marroquí, francesa e italiana. El clima es templado y rara vez se pone por encima de los 30 a mediados de. Hay muchos deportes y actividades disponibles en la zona.